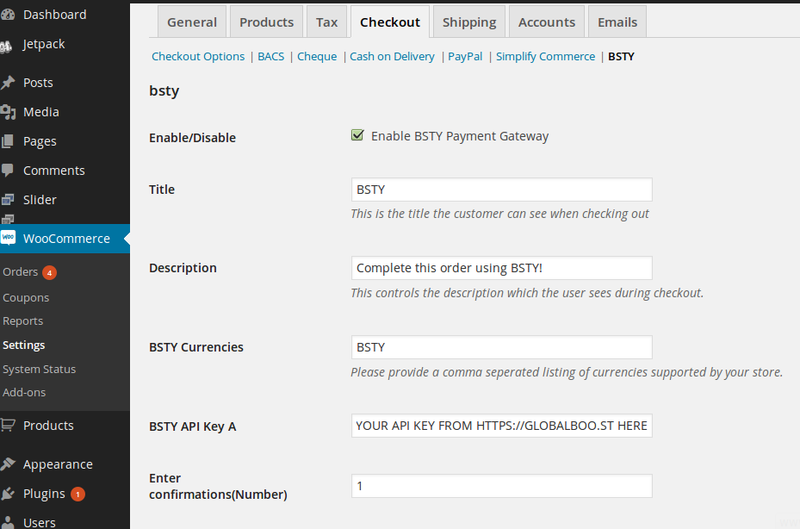 This is a quick tutorial to show you how to accept $BSTY with GlobalBoost WordPress WooCommerce Payment Gateway plugin. 1. If you haven’t already made an account at main site, please follow this link https://GlobalBoo.st/signup.php and make sure to confirm acct creation via email link. 2. Once account is confirmed and you are logged in use the sliding menu on the top left to select “Payment Gateway”. 3. Click the highlighted “Click here to Download BSTY WordPress Plugin(Version 0.1)” and save the GlobalBoost payment plugin to your computer. 4. Make sure the WordPress installation on your website is up to date, and that you have WooCommerce installed. 5. Use the left side menu “Plugins” and then select sub-menu “Add New”. Then click “Upload Plugin” from top of the screen and select BSTY WordPress Plugin from your hard drive. 6. Once installed click the WooCommerce “Settings” and select your location. Make sure to set the base currency to US Dollars for the plugin price API to work. 7. Now click “Checkout” from the WooCommerce tabs to configure your payment options. Click BSTY. Enter your BSTY API Key from your https://GlobalBoo.st/ account, and select the number of confirmations you want before releasing the product. That’s it! You are now configured to sell products using amazingly successful WordPress, and it’s most powerful turn-key sales software WooCommerce! No GPU miners have been configured for Yescrypt, that we are aware of. 3. Let the wallet sync before you start mining. This is pointed out due to some anxious miners we have had. 4. Solo Mining: Click the Mining Button and Select how many threads (CPU’s) you want to use. 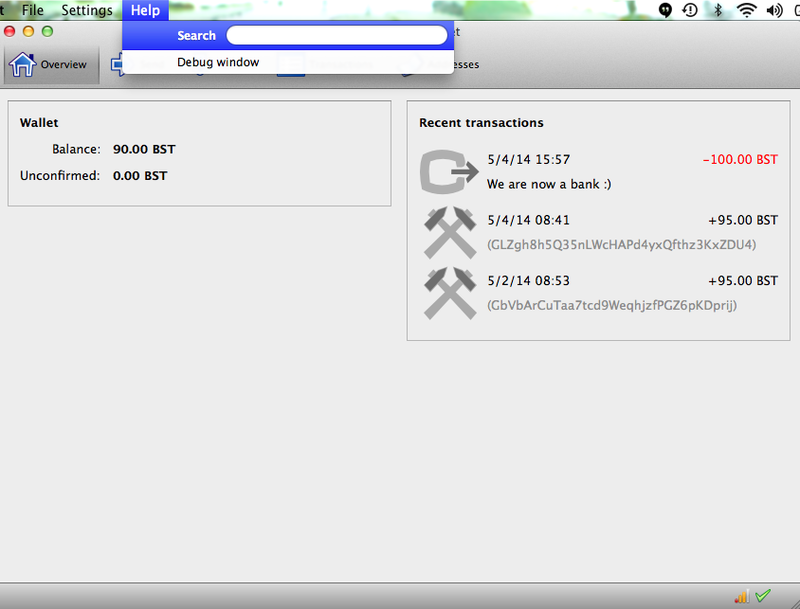 Click the Start Mining Button in the bottom right hand corner of the wallet. YOUR SOLO MINING!!! 5. Pool Mining: You will need to make the switch to the Pool Mining selection in the wallet. 6. Download the Minerd version below that matches the wallet you downloaded (Windows or MAC). You will need to put the minerd files in the same folder as the GlobalBoost-Y.exe file. This has to be done to pool mine in the wallet. 7. Pick one of the pools below and make an account where you like. We will have more coming online soon and the ANN will be updated accordingly. Payout is PPLNS. The payouts are based on the number of shares (and its difficulty) over a 24h window, or the last 3 blocks found by the pool. Whatever comes first. The predicted payouts will look very small at first but it will actually be more than other pools over time, unless everyone stops mining. 8. Fill in the information from the Getting started on the mining pools site. Below is the altpooler example as they do not have a help page. You should now be pool mining. We are looking to expand our Official Forum and want to move some conversations there. We will be looking for Moderators, so please ask us and we will talk. Live Support in IRC, also accessible from the Wallet. Just click the IRC Chat Button and Login. Click the Kiwi Button below to launch the IRC now. That’s Bruce Porter on left, and Wayne Stevens on the right. Bruce was a point man and Wayne a machine gunner. 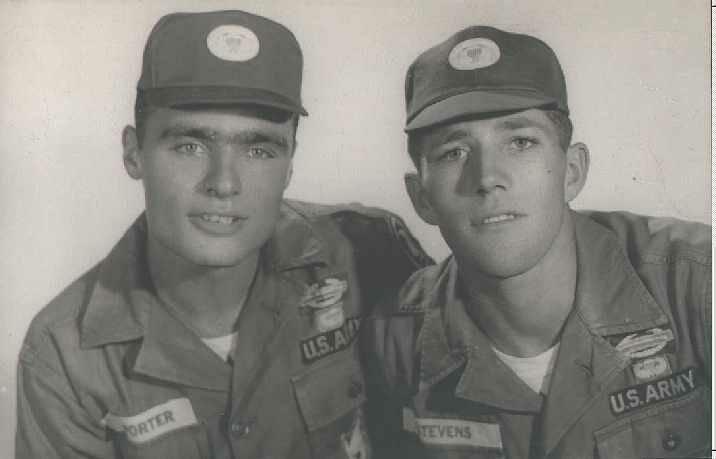 They had just been awarded their Combat Infantry Badges and went down to Bien Hoa and had their pictures taken. Showing off 🙂 1965 probably around July or August. Bruce went on to retire from the Army, have 6 kids, and lives in Sanford, NC with his wife. When we last we heard from Wayne, he was in California. Wayne tracked down Bruce about 12 years ago, he was mad that Bruce had not told him that he reenlisted, and gone back to Vietnam. LOL!! Said he would have re-upped, and gone back also. But Bruce had extended on his first tour, and left the infantry for the LRRP teams so it was a much longer time than Wayne thought anyway. Last they spoke was about 4 years ago, Wayne had just had bypass surgery. 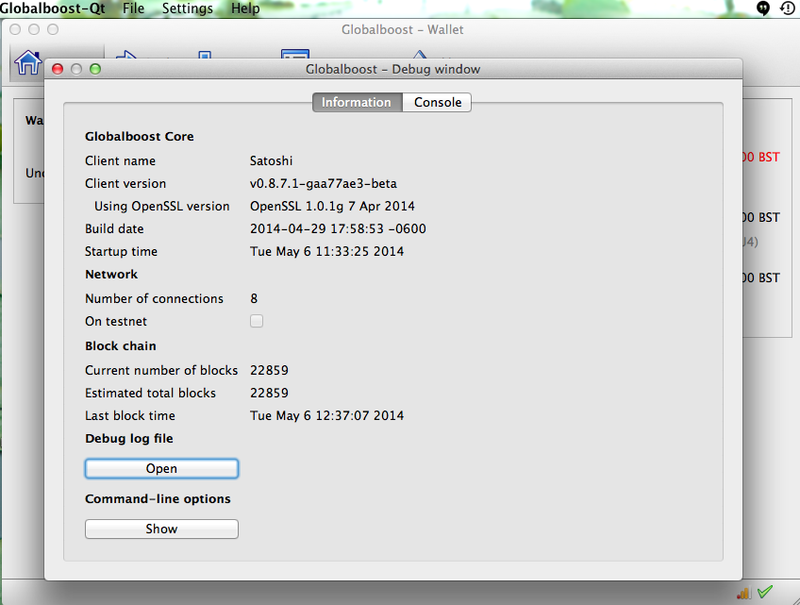 This is a quick tutorial showing how to setup your GlobalBoost wallet. 1. Go to https://bst.GlobalBoo.st and download a wallet. If on Windows save your wallet to Desktop. If on Mac, follow instruction window and drag Globalboost-qt to Apps Folder. 2. Extract and open the GlobalBoost wallet. It will need to sync with the network. This will not take long, and you can view the status at the bottom of your GlobalBoost wallet. We recommend that you wait until the wallet is synced until you send or receive BST. You are now lending your spare computing power to the network. When your computer solves a block, you make 95 BST. − Advertise and launch Google+ Hangout webinars broadcasting live on Youtube and your own web page. − Set planned posts across multiple networks, upload photos to social networks, follow & unfollow users in Facebook, Twitter, Linkedin, and Instagram providing an easy and cost effective way to advertise online. − Pay and get paid instantly for sharing content, post and fulfil freelance work. − Launch and monitor targeted advertising campaigns leveraging multiple networks. These products will be available to the public for a small fee, and are available to all wounded veterans worldwide free of charge. The GlobalBoost team is committed to tearing down borders and fiat monetary limitations, providing a platform for wounded veterans to crowd-source funding, and earn money easily. Click the links below to download your wallet and start using BST today!